If you're preparing for a job interview, congratulations on getting to this stage of the hiring process. It means you're doing a lot of things right. Your next step is to ensure you are ready to demonstrate to the employer that you are a great fit for the company. Employers don't normally ask completely random, unpredictable questions or use bizarre techniques in interviews. There are standard questions (with several variations) and techniques that are commonly used. That means it is often possible to predict the majority of questions an employer will ask, which makes preparing for a job interview easier than you might think. Your best defence against tricky questions and nervousness is preparation. If you're in a rush, click any of the links below to jump down to a specific topic. The minute you're invited to an interview, you'll have a lot of information to keep track of and a lot of details to plan. Before you do anything, download and print the free interview information tracking sheet so you don't miss a single important detail. What should you do when you get the call for an interview? What information can you find out about the company? What general questions are commonly asked by employers? What specific questions might be asked based on the type of work you are seeking? What are the reasons and concerns behind the questions the employer will probably ask? How will you answer those questions? Do you have any personal or professional issues than might come up and could be a concern for an employer? How will you address those issues to reduce the employer's concerns? Are you organized and prepared to get there on time and appropriately dressed? What techniques might the employer use and are you prepared to handle those techniques? Are you prepared to follow up afterwards to solidify a great impression in the employer's mind? You need to start preparing for a job interview immediately. Even at the stage when you are on the phone with the employer or a receptionist who is inviting you to an interview, your suitability as an employee is being assessed. It is important to make a great impression on the phone, gather all of the important information you need, and immediately begin to make necessary arrangements for the day of the interview. 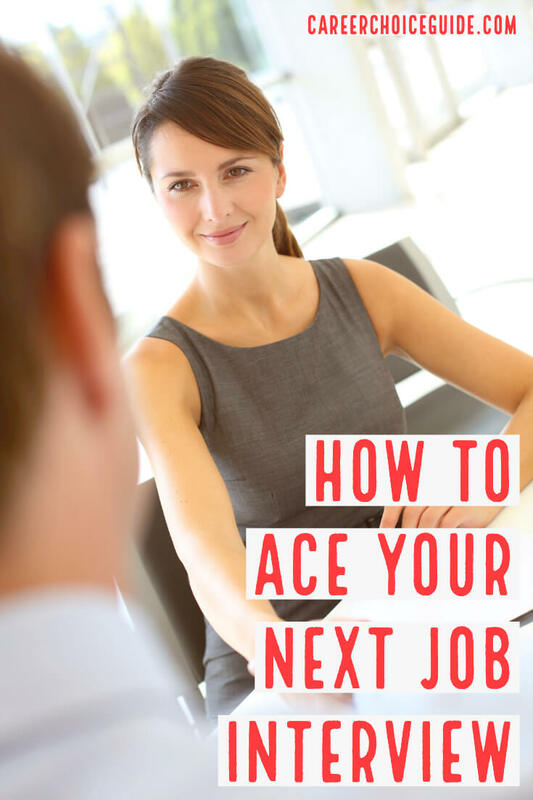 The article below shows you how to begin preparing for a job interview immediately after you get the call from the employer. I am certain you have heard that researching the company is an important part of preparing for a job interview, but it is crucial that you take that advice seriously. Very few job seekers put much effort into researching a company. Employers are far more impressed with candidates who understand a bit about their company. Therefore, doing some good company research is an extremely simple way for you to stand out from the competition and a vital part of preparing for a job interview. The article Research a Company describes the information you should look for when you do your company research, how to find that information even when it is not easy to find, and how to use the information to make a great impression with employers. You should never go into an interview without a general idea of the salary range that is reasonable to expect based on your industry, your location and your level of experience. Here are several sources you can use to find good career salary information when preparing for a job interview. Organization is key to remaining as calm as possible on the big day. You do not want to be frazzled, running around figuring out what to wear and how you'll get there on the actual day of the interview. Take time, ideally a few days before, to map out your route, determine what you'll wear and gather any materials you want to bring on that day. If you are thorough about preparing for a job interview, you can minimize interview stress, and the only thing you will have to think about on the actual day is answering questions well and making a great impression. Part of preparing for a job interview is determining how to dress appropriately based on the company and the type of job you are seeking. Here are tips on how to determine the best attire for your specific line of work. Doing a mock (practice) interview is an integral part of preparing for a job interview. These practice questions will help you. You might be asked to provide references, so you'll need to be ready with a list of people the employer can call. These tips will help you understand the reference check process and be prepared with good references. You can use this reference page templateto help you set up your own page. 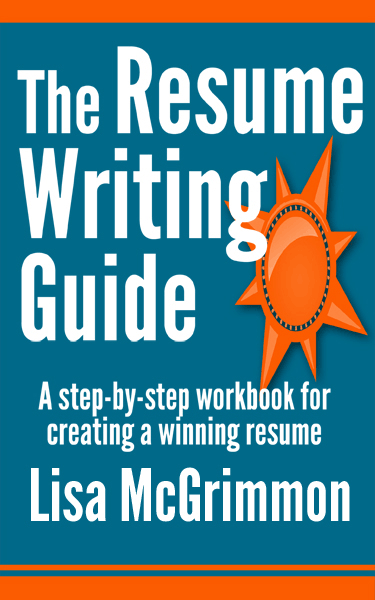 The article Good Job References will show you how to prepare your references so people on your list will be able to say great things about you when the employer calls them. Luckily, there are several questions that are very common, and if you know what the employer will probably ask, preparing for a job interview will be a lot easier. It's actually possible to predict and prepare for many of the questions that employers normally ask. I give all clients, which applies to answering any interview question. Common Questions - Several common questions with tips to help you prepare winning answers to these questions. 3 Types of Questions - Understand the three basic types of questions when preparing for a job interview to answer the most difficult questions an employer might ask. Difficult Questions - How to predict the most difficult general and industry-specific questions you will most likely encounter. More Difficult Questions - How to answer questions about a negative or challenging situation. 4 Common Mistakes People Make - Discover the most common mistakes people make and how to avoid them. Behavioral Questions - Sample behavioral questions, and tips to create great answers to behavioral questions. STAR Interview Technique - STAR is a simple and effective technique for answering behavioral questions. Situational Questions - Situational questions are designed to help the employer determine how you would handle a specific, challenging situation. Here are sample situational questions and tips to prepare for this type of interviews. More Sample Situational Questions - More sample situational questions and answers to help with preparing for a job interview. Crazy Questions - Find out what's behind the crazy questions employers sometimes ask, and learn how to answer these strange questions with confidence. What is Your Greatest Weakness - Are you completely stumped when employers want to know, what is your greatest weakness? Here's how to answer that question so you make a great impression and show the employer you have excellent problem solving skills. What Can You Bring to This Company? - A reader wanted help coming up with good answers to the interview question, what can you contribute to this company? See his question and my response here. What to Ask the Employer - Most people know that they should prepare questions to ask the employer after an interview. However, many people really worry about this part of preparing for a job interview. Here are several great questions you can ask and a few you should never ask. Salary Negotiation Tips - Salary negotiations don't have to be daunting if you've prepared yourself well with a few facts and salary negotiation tips. 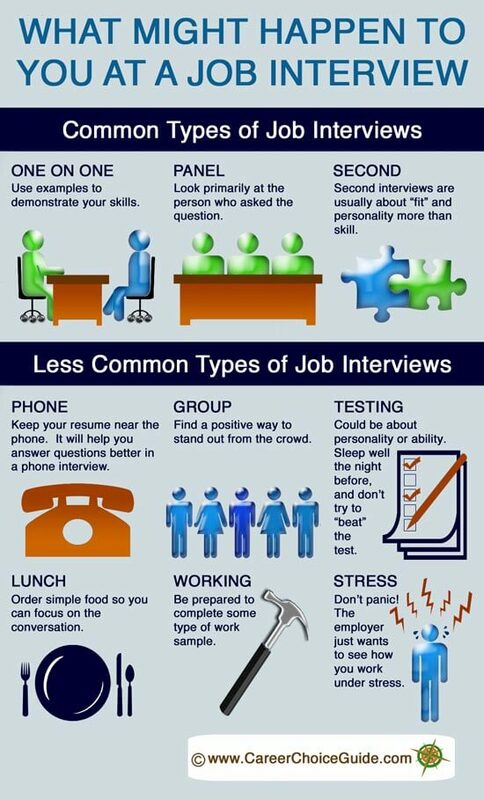 The chart below provides an overview of techniques employers like to use at interviews. Below the chart, you'll find links to more detailed information about each technique. 10 interview techniques an employer might use. Many people say they feel most comfortable with this technique. One on one interviews, along with panel interviews are probably the two types of interviews you will experience most often. Although one on one, panel, and second interviews are overall the most common types of interviews, standard techniques can vary by industry. For example, interviews for police officer jobs are often stress interviews because the employer needs to know the candidate can diffuse stressful situations. Work that requires manual dexterity (like manufacturing jobs) often include psychological testing which can test a person's fine motor skills. Panel interviews are conducted by more than one interviewer. Often employers use panel interviews to give staff who will work closely with the new employee an opportunity to meet the candidates. They can also be used to allow the team to share responsibility for hiring new staff. If you are called for a second, or third interview, you are well on your way to being offered the job. Follow up interviews are often more about assessing your personality than assessing your ability to do the job. At this stage, the employer is probably convinced you have the skills he or she needs and wants to determine if your personality and work style would be a good fit with the work, their customers and the existing staff. An initial screening interview is usually conducted as an in person, one on one interview or a telephone interview. If employers have several promising candidates, they may conduct initial screening interviews with several candidates and use the information gathered to select two or three candidates to bring in for second interviews. Employers may use a telephone interview to do some initial screening before committing the time to bring you in for a full, in person interview. Ensure you are in a quiet place with no distractions in order to make the best first impression. This technique involves the employer interviewing more than one candidate at a time. It is not used very often, but sometimes employers will use a group interview to see how you work as a part of a team, to be more efficient with their time or to cause a little bit of added stress and to see how you react to that type of stress. Sometimes employers purposely cause more stress than usual. They use this technique because the work will involve certain types of stressful situations, and they want to see if you respond effectively to this type of stress. If you are invited to a lunch interview, read up on your table manners and avoid ordering any food that is difficult to eat (it will distract you from the conversation). Do keep in mind that lunch and dinner interviews are not common, and unless you will be entertaining business contacts on a regular basis as a part of your role in the company, it is not something you are likely to experience. Some employers use psychological tests to assess your personality or your aptitudes (the things you will likely be good at) as they relate to the job. If you are required to undergo this type of test, do not try to beat the test. Answer questions honestly and to the best of your ability, get a good night's sleep and go dressed to make a good first impression. Some companies require candidates for internal opportunities to go through a formal interview process. Do not assume that the coworker who interviews you knows all about your skills and experience just because he or she is your colleague. Describe your skills and qualifications in detail just as you would for an interview with someone you didn't already know. Wouldn't it be fantastic to get some good feedback from employers to find out what they really think during an interview? Here is some job search advice straight from employers who tell you exactly what is going through their minds when they review cover letters and conduct interviews. Even after you leave the employer's office, you still have the power to impact the hiring decision. After an interview it is crucial to take some time to make notes. This article will show you how making notes will help you land the job you want. Sending a thank you note is an extremely easy way to stand out from the crowd. Thank notes make a great impression, and very few people actually send one, so it is an easy way to demonstrate that you will go one step beyond the average person to do a great job. More tips for getting the most benefit from your thank you notes. Format for writing great business thank you notes. A thank you letter sample to give you some inspiration for writing your own notes. A thank you note is only an effective follow up strategy if it arrives in time to have an impact on the employer's hiring decision. Here's how to submit your note so it reaches the employer in time to have an impact. Before you accept an employment offer, it is crucial to find out all of the terms of employment and carefully assess whether the position meets your needs. Discover what to ask the employer and what to ask yourself before accepting a job offer. Discover when you have the most power in the job search process, and learn how to negotiate an employment offer to avoid disappointment and get a great deal. These tips will help you to ensure that turning down the job offer is the right decision for you, and decline the offer gracefully.